Incredible illustrated story of Psalm 23! 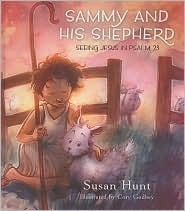 Each chapter takes a verse of Psalm 23 and weaves a children’s story out of it, bringing the Psalm to life for youngsters. Sammy the sheep is very happy and well provided for by his shepherd who loves him and cares for him. Sammy meets a scraggly sheep on the other side of the fence that he names ‘My Friend’. She is missing the four key elements to having rest, when Sammy can easily sleep in the green pastures. She is missing safety, cohesiveness amongst all of the sheep, peace and food. Later ‘My Friend’ is laying on her back ‘cast down’ and Sammy’s shepherd goes to her and rights her. The shepherd sees how down the little sheep is and goes to her shepherd and buys her from him. He renames her Precious as she is to him. Now with Precious in the herd, Sammy can begin to teach her how to rely on the shepherd. After each chapter there is a talk about it section to turn to in the back of the book. Some time to reflect on the verse and read other scripture to go along with it. There are 11 chapters and just the perfect size for devotional time, or bedtime Bible reading. Fantastic illustration of Psalm 23 in vivid detail. On a level children can understand and relate to their own lives.